SSD vs RAID0 for Gaming: SCIENCE! A while ago, I bought an SSD (128GB Crucial M4) off Amazon, with the idea of putting it in my gaming rig as a “game cache”. My plan was to install my most played games on it, while the rest of my games sat on my current setup – Two 1TB Seagate Barracudas in RAID0. Here’s a cell phone pic of my setup: Ignore the awful position of the cable/drive on the new SSD – it’s for testing purposes. E: RAID are the same raid drive – no difference, but two data collection runs, since the numbers were much more inconsistent. I had programs running on that drive while testing, meaning there’s a lot more noise. To do actual science I would run a lot more tests, but I feel that my results were good enough to make decisions on. G: SSD is the SSD with two different stripe sizes: 4kb and 32kb. I believe the 4KB performed better because some cursory research showed that the drives are manufactured to be used with a 4kb block size, which makes sense. Data was collected using Roadkil’s Disk Speed under light system load. 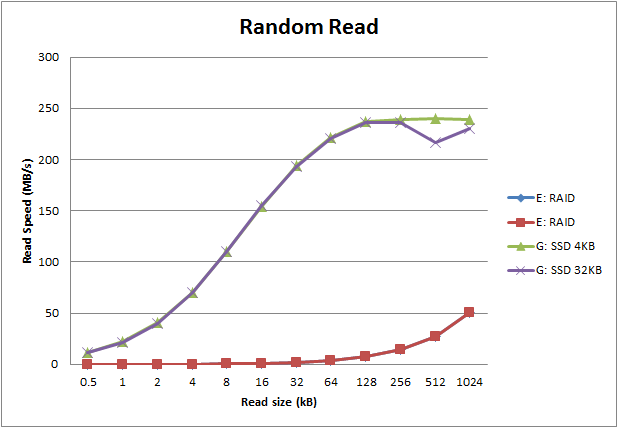 The interesting result is in the sequential/random difference on the RAID. 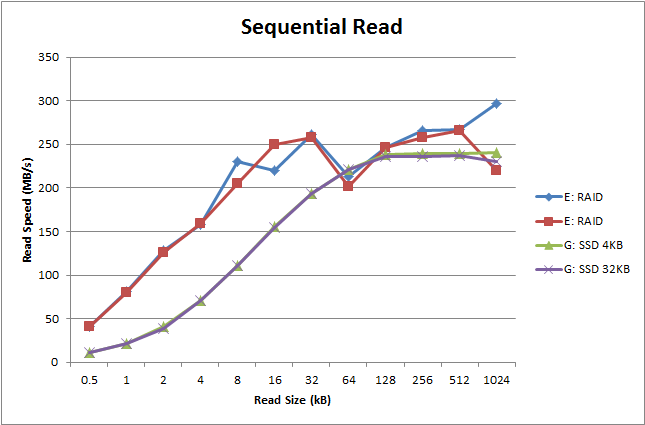 In sequential reads, the RAID actually comes out faster than the SSD except at the 64kb read size. I believe this is because I have the RAIDs striped at 64KB, with 64KB blocks, and I must be hitting some sort of strange misalignment at exactly that size. However, the RAID drops to basically zero (<1MB/s) when performing random read, while the SSD loses no speed at all. This is, of course, the main reason for getting an SSD. Now, as far as I’m aware, games actually optimize for sequential read, since that’s how most hard drives are going to load them. What this means, as far as I can tell, is that I would actually be hurting my game performance by moving my games over to an SSD. I’ll edit this post, after I play some Skyrim+HD Textures on the SSD and check if the load speeds feel any better. Also: if anyone more experienced with hardware has any suggestions, I’m all ears! 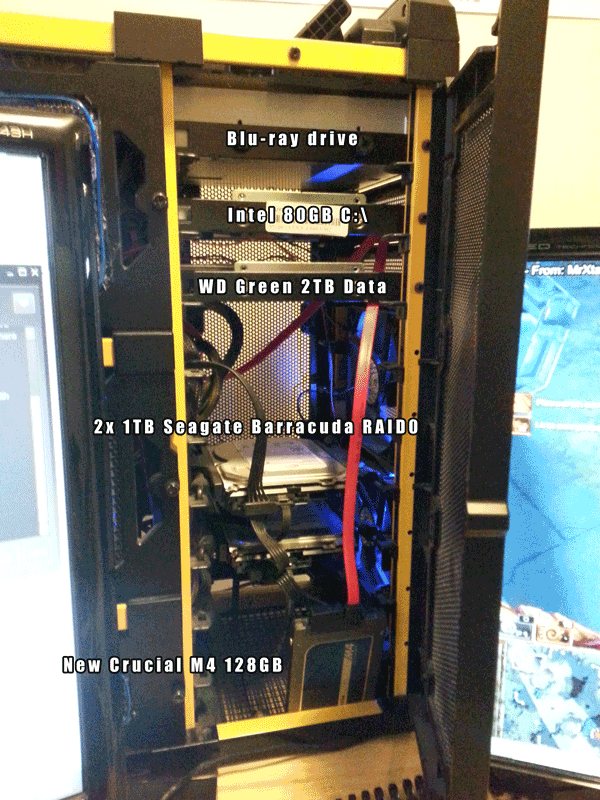 This entry was posted in Technical and tagged blaggregator on April 19, 2014 by erty.